Take our free placement test to find out which level is best for you. Students applying for a student pass are not allowed to attend EGL Short courses. Students who are entering Singapore must obtain a valid social visa from ICA which covers the four weeks of their course before being allowed to enter the course. It is a condition of entry that student have a valid visa which covers the duration of the course. Ascend Education Centre will not be held responsible for any student failing to secure a 4 week social visa. Ascend Education Centre will issue a letter of result to the student upon verification of their placement test. 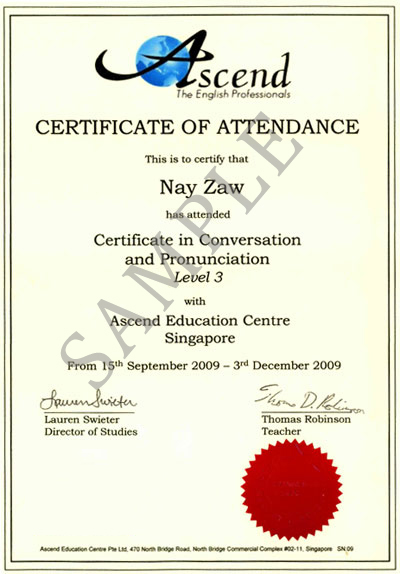 Ascend Education Centre Pte Ltd only collects course fees once the student has taken their placement test at Ascend Education Centre and signed. Ascend's English as a Global Language (EGL) short courses are stand alone modules which are useful for students who wish to complete their studies over a four week period. The Short Courses (from Starter to Advanced levels) cover four skills: speaking, writing, listening and reading, as well as a focus on vocabulary development, pronunciation and grammar. The Short Courses are 5 hours per day, Monday-Friday, reflecting the centre’s educational philosophy in providing students with the environment and opportunity to apply what they are learning so that they can express themselves with confidence. For a period of three hours the students will have an EGL class limited to 16 students. In class, students are inspired and mentored by their teacher in developing their speaking, reading, writing and listening skills as well as improving their vocabulary, grammar and pronunciation. In addition, our five hour program includes a two hour focus on the practical application of the skills acquired in the classroom. 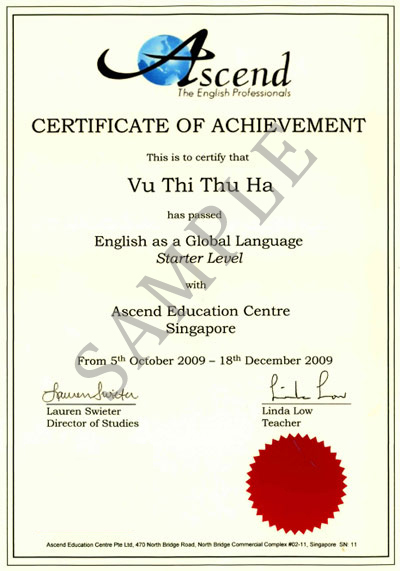 Our EGL Short Courses at Ascend Education Centre consists of 5 language levels from Elementary to Advanced. Students are assessed through a combination of course work and module exams. Each EGL course is divided into three four week modules. During each module, your teacher will give you a written assignments, and assess you on your speaking. At the end of each module there is a module test. A combination of your assessed work and module test results determine if you can progress to the next level. The overall pass mark to progress from one course to the next is 60%. Students receive a Certificate of Achievement on successful completion of a course. If a student fails a course they may repeat the course or choose to discontinue. Students who fail a course will receive a Certificate of Attendance. All students must have an attendance record of 90% to sit for their modular exams in the month in question. In addition, please note that students are expected to complete homework on a timely and regular basis.